School's almost over and Summer is almost here, so it's time to arm yourself with all the things your pet will need to stay cool, as the temperatures begin to rise. Whether or not you live in an area with extreme heat, pet owners should always be aware that heatstroke, and other heat-related problems, can pose a serious health threat to your pet. If you're not already familiar with how to prevent and identify heatstroke in your pets, first you should consult with your Veterinarian on how to safeguard your pets from heatstroke and other heat-related health issues. 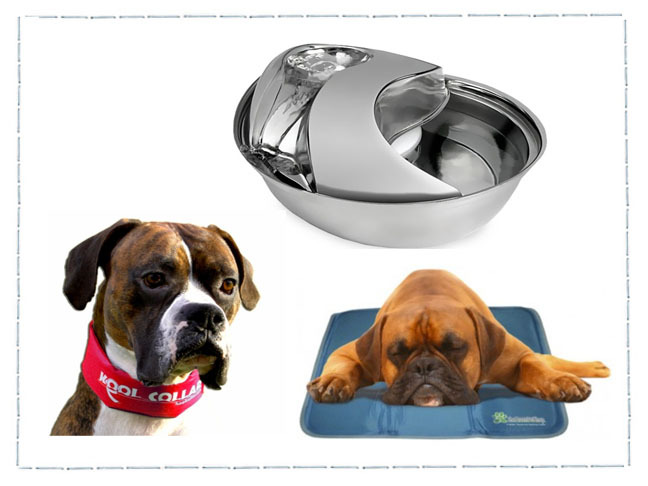 After you've consulted with your Vet, here are a few great pet accessories that can help keep your pets cool and well hydrated this Summer and throughout the rest of the year too. Staying well hydrated is top priority for both humans and pets and that's especially important during the hot summer months. So it's our job to make sure our pets always have a fresh, clean water source readily available to them at all times. 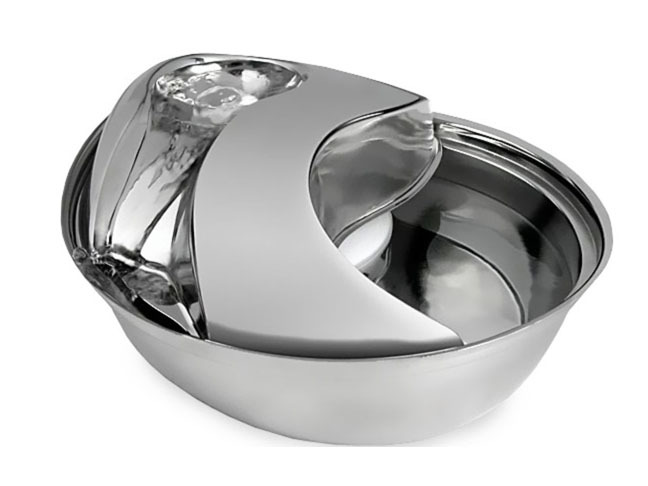 So if you're pet is already a little bit finicky about drinking enough water, this Stainless Steel Raindrop Water Bowl will be just perfect for enticing them to stay well hydrated. It's fountain-like design constantly circulates water, so it will help attract your pet to drink. Plus, it's replaceable charcoal filter helps keep the water clean and pure, so there is less risk of bacterial infections. You're probably already aware that dogs don't have the ability to sweat as a means of cooling their bodies, in the same way that humans do. So because of their unique physiology that does not allow them to cool down by sweating, our furry friends are much more susceptible to suffering from heatstroke. 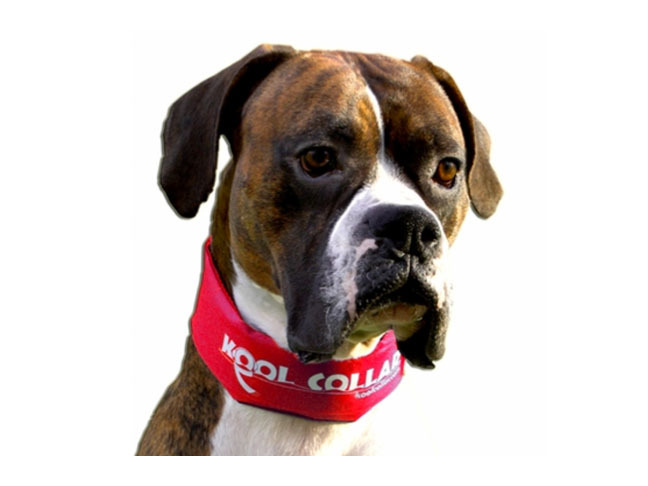 This Kool Collar is cleverly designed to use melting ice to act as a sort of artificial perspiration to aid in help keeping your dog cool. It's super easy to use, very durable, reusable and available in multiple sizes too. Another way to help keep your pet cool when the temperature rises, is by providing a cool place for them to sleep with this Cool Pet Pad. What's unique about this pet mat is that it doesn't require water or electricity since it's activated by weight or pressure, so the cooling effect begins as soon as you pet lies down. Plus it's available in 4 different sizes, so it can easily fit into standard sized beds and crates. How cool is that? How to Prepare Your Dog for Your BabyReady For A Pet?